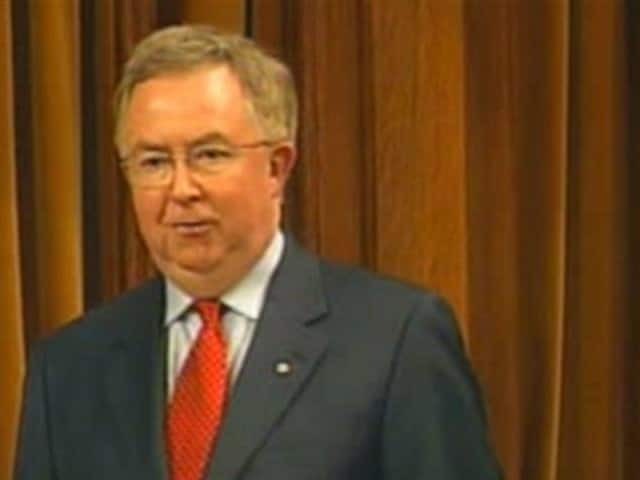 Joe Clark wants Canada to say yes - not to him, or to his party, but to constitutional change. In his role as minister of Constitutional Affairs, Clark has been travelling the country to win support for the Charlottetown accord. The accord, a proposed constitutional amendment that will bring Quebec into the Constitution, represents a new direction for the country. In this CBC radio clip, Clark admits the No campaign has the momentum. In just three days, Canadians will vote in a referendum on the accord. All 10 provincial premiers support it, as do the federal Liberals and NDP and most First Nations. But sovereigntists, the Reform Party and many smaller groups are strongly opposed. With the No side leading, a lot of people are going to have to change their minds if the accord is to be accepted. Clark says he's "pretty pessimistic" about the future of the country if the vote is No. • Joe Clark was named to lead a new Cabinet portfolio, Constitutional Affairs, in April 1991. As minister, he was charged with taking on the challenge of national unity in the wake of the failed Meech Lake Accord. • Clark didn't immediately accept the post, since he enjoyed his previous portfolio of External Affairs. He negotiated for several days with Prime Minister Brian Mulroney to gain a dedicated staff and considerable leeway with the position. • In May 1991, Clark said it would be "impossible" to deliver a constitutional package before the fall of 1992 – a deadline set by Quebec when it began preparations for another referendum to be held at that time. • Clark headed an 18-member cabinet committee that, beginning in September 1991, travelled the country to consult with Canadians on proposed changes to the Constitution. • In August 1992, changes to the Constitution were spelled out in the Charlottetown accord. It recognized Quebec as a "distinct society," said aboriginal people had an inherent right to self-government, and would introduce a "triple-E" Senate – elected, equal and effective. • A referendum was set for Oct. 26 to ask whether Canadians would accept the changes. The question: "Do you agree that the Constitution of Canada should be renewed on the basis of the agreement reached August 28, 1992?" • When the accord was first reached, it was uncertain whether a referendum on it would be held at all. But on Sept. 3, Prime Minister Brian Mulroney announced it would go ahead. • When the results came in, voters only four provinces – Newfoundland, Prince Edward Island, New Brunswick and Ontario – had voted in favour of the accord. In order for it to pass, a majority of voters in each of the 10 provinces had to say Yes. • "The Charlottetown Accord was a product, which was judged, and found wanting, in the referendum," Clark later wrote in his book A Nation Too Good to Lose (1994). "The debate generated a dynamic of its own and, perhaps uniquely in our national history, caused large numbers of Canadians to become personally involved in considering a common set of questions about Canada." • In this clip, reporter Michael Enright refers to Clark's "Beirut" remark. At one point during the campaign, Clark made an offhand remark that "once Beirut was one of the best places in the world to live..." and suggested that Montreal could suffer the same fate Beirut did. • Beirut is a city in Lebanon that, in the 1980s, was nearly reduced to rubble by civil war. • In the lead-up to the 1993 election, Joe Clark announced he wouldn't be running again as an MP. See a CBC Archives clip in which various politicians pay tribute to Clark. • Clark emerged from "self-imposed exile" to caution voters against annihilating the Tories under new leader Kim Campbell. He said the Reform Party and the Bloc Québécois would create a deadlock in a five-party House. • In the election, the Tories won just two seats in Parliament. • After leaving public life, Clark set up a consultancy, Joe Clark and Associates, to advise Canadian companies doing business overseas. • Clark also spent a year as a visiting scholar at the University of California at Berkeley, where his wife, Maureen McTeer, also taught. • In 1996, he formed an oil-and-gas exploration venture, CanOp Worldwide, with three others.